This is Jane posting an entry from Susannah Dolance. 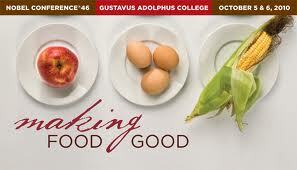 Last week, Jane, JoAnne Rohricht, and I attended the Nobel Conference at Gustavus Adolphus College. The theme was “Making Food Good.” I was excited about the conference because I have both a personal and professional interest in food. I’ve always enjoyed eating, but I became interested in the behind-the-scenes of food about ten years ago, when I lived in Ann Arbor, Michigan and started shopping at the People’s Food Co-op. As a budding sociologist, I was fascinated by the many ways individual food choices and eating habits are connected to broader social structures. In 2004, I moved to the Twin Cities to take a job as an instructor of Sociology at Century College. In 2005, I began to put together an Introduction to Sociology class for the summer term that teaches the basic concepts of sociology by examining contradictions in the world of food (e.g. too much food in the developed world, while there’s not enough in the developing world). I’ve been teaching that class every summer since, so I’m always on the lookout for new perspectives, ideas, and controversies in the study of food. The Nobel Conference looked like a great place to explore some of these ideas. I invited folks from First Church to go to the conference because I’ve long believed that the way we produce, distribute, and consume food – locally, nationally, and globally – says a lot about our values, morals, and beliefs about how we treat humans, animals, and plants, and the Earth more broadly. I learned a lot by attending the conference, but I guess there were two things missing for me. First, JoAnne and I agreed that the speakers at the conference seemed to be unwilling to contradict or critique each other’s work, even when they clearly disagreed with each other. I think having some more of debate on the panel may have been useful. Second, I missed the opportunity to talk about the issues that came up with others in the community who are similarly concerned with these issues, and with other issues that interest me, like the treatment of animals in the industrial food system, environmental problems that result from the current food system, the omnipresence of processed foods in the U.S., the high cost of healthy food that creates something of a two-class food system (as Nestle referred to it at the conference), and the unequal distribution of food globally that leaves 925 million people hungry worldwide. So I thought we might be able to continue this conversation. Some folks at First Church who weren’t able to attend the conference have asked that we schedule a conversation to discuss some of the ideas and arguments that were addressed by the speakers. If there’s interest, I think that’s a great idea and I hope Jane and JoAnne will also be a part of that conversation. I’m relatively new to First Church, so I don’t know how much interest there is in this stuff, but other ideas I have are a local cooking group – we could meet at each other’s homes for a monthly potluck comprised of food made of local ingredients. Or we could read some books that deal with food issues. I assume many of you have read Michael Pollan’s Omnivore’s Dilemma, but another book that comes to mind that’s related to food and other kinds of activism is Colin Beavan’s No Impact Man. I’m sure others have other ideas of books that have inspired them. If you’re interested, comment here or email me at sdolance@gmail.com. I’m definitely interested in being a part of a conversation about the conference, Susannah. It would be very interesting to hear about what you all learned there. Count me in!